The infamous Backstage Series by Founders has produced some mighty fine beers. I've reviewed a couple of them myself, and have had others away from this blog. To me, the series ebbs and flows as you will either get an amazing beer, or a dud with nothing that falls in between. 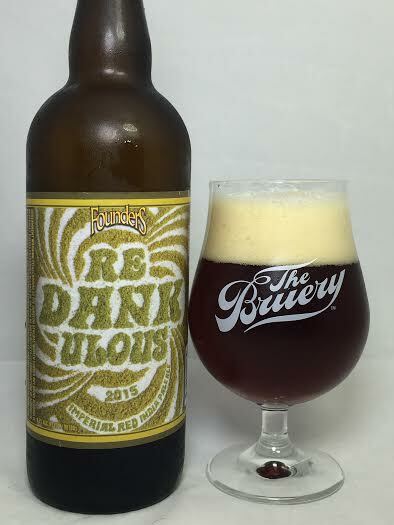 Redankulous is a massive 9.50% Red IPA made with Chinook, Mosaic, ans Simcoe hops. Pours a beautiful, glowing copper/amber. Mostly transparent with a slight chill haze. Got over two fingers of an off-white, eggshell head. Aroma has sweet malts and some pine, but otherwise it's pretty bland. If anything, this beer is "Readankulous" in regards to the malts and not the hops. The biggest flavors I pick up are some caramel and something similar to a syrupy cherry (almost NyQuil-esque). Definitely the theme here is sweet malts and heavy resin, but really no hops. It's a 9.50% beer called "Redankulous" and the hop presence is practically non-existent. If I concentrate hard enough, maybe I can pick up some earthy dankness, but is so far in the background that it's barely worth mentioning. Some underlying pine and spruce is also there as well. Now, even though the hops are absent and this has an abundance of sweet, caramel malts, I will say that the flavors I am getting are pleasant and go down easy. I was surprised this was almost 10% abv as it drinks much easier than that. It goes down more like a standard amber ale rather than an imperial, but the feel is still full-bodied for the style with absolutely no alcohol taste. I am severely disappointed with the outcome of Redankulous. When a red (amber) ale is done right, the malts and hops should be in equal balance with a proportionate share of bitter hops and sweetness. Instead, this opted for all sweet malts and barely, BARELY any hop flavor. While the beer was still drinkable and enjoyable for what little flavor was there, this one really just struck out looking.